LANCASTER – The City of Lancaster is currently accepting monetary donations for the Lancaster Lunchbox Program. The objective of the program is to serve disadvantaged students weekly by providing care packages filled with nutritious foods to take home with them each weekend. The program, which is powered by the Lancaster Youth Commission, takes place at Sierra Elementary School. The care packages are assembled by volunteers and distributed on Fridays after school. Each package contains two breakfast items, two snack items, two lunch items, one fruit cup, one vegetable cup and two main course meals. This menu accommodates a child’s daily nutritional needs, providing the nourishment required during weekend hours when the student is away from school. The issues associated with childhood hunger can be addressed, in a large part, through the Lancaster Lunchbox program for a modest financial investment. Serving one student costs $3 per week, $12 per month or $144 per year. 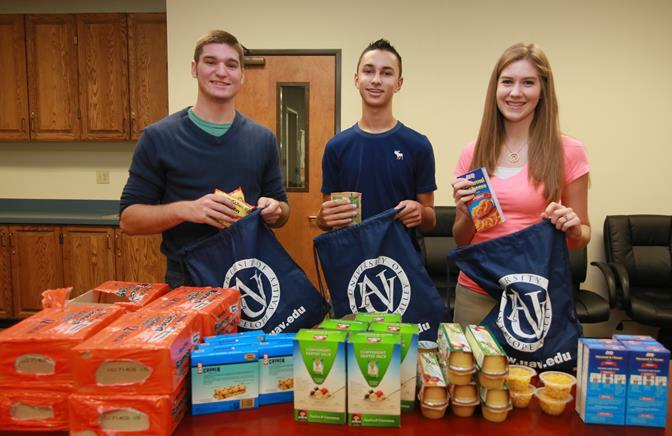 Through the Lancaster Lunchbox program, the City and the Lancaster Youth Commission seek to inspire and promote the expansion of this effort throughout the Lancaster School District, striving to eventually operate food pantries in every local school. All tax deductible monetary donations can be made at Lancaster City Hall, 44933 Fern Avenue. For more information, contacting the city’s Parks, Recreation & Arts Department at 661-723-6077. 8 comments for "Lancaster accepting sponsorships for school “Lunchbox Program”"
So proud of those strong young individuals. Because of them, lives are changed. Great idea and helpful. I just hope its healthy. Also, has the city checkdd into the county? I understand the county gives cities monies to spend each year on outreach and community programs for its residents. Excellent idea! Way to invest in our future and show them how to be compassionate and loving toward others. What a wonderful idea this is!!!! About what my kid was going to eat, when he has home all weekend. It’s very stressful living paycheck to paycheck. Not only are u providing the kids with nurishment when they might have gone without. Ur also giving their parent piece of mind. Can volunteers help with packing the bags? I actually started the program and operate it with assistance of the youth commission. There are many ways people can help! You can go to lancasterlunchbox.com to learn more! I am very happy to hear about this program. Keep up the excellent work.